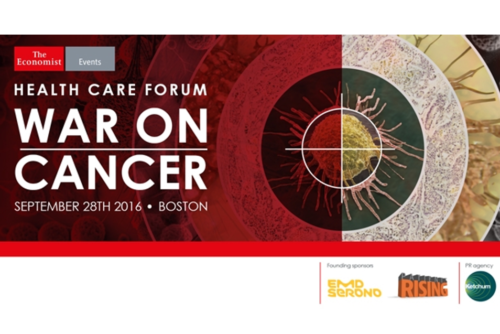 On September 28, 2016, The Economist hosted its second annual “War on Cancer” event in Boston, Massachusetts. The one-day meeting featured influential speakers, including Greg Simon, the Executive Director of the Cancer Moonshot Taskforce; Kyu Rhee, the Chief Health Officer at IBM; and Howard Krein, the Chief Medical Officer at StartUp Health. The World Health Organization (WHO) estimates that one-third of all cancers are preventable. The Centers for Disease Control and Prevention (CDC) further notes that a person can reduce his or her cancer risk can by engaging in healthy activities – avoiding tobacco and alcohol, exercising regularly, and maintaining a healthy diet and weight. While the US Congressional Budget Office (CBO) – the agency responsible for estimating costs of proposed federal legislation – projects that healthcare costs will be the primary driver of national debt in the next four decades, the agency continues to favor treatment instead of prevention. It primarily uses a 10-year window for making projections, which does not account for the long-term impact of prevention. Despite the WHO and CDC’s conclusions that cancer prevention works, The Economist event largely focused on treating cancer. One speaker went so far as to contend that there is not enough evidence for the CBO to value prevention. With high-level events focusing largely on the treatment agenda, the prevention voice remains muddled and healthcare costs continue to rise. Both the treatment and prevention agendas must “seek to understand to be understood.” Without finding a common ground, improvements in cancer will only remain elusive. Were you at The Economist’s War on Cancer event? How are you taking action on cancer prevention? We would love to hear from you! Tweet @VitalityUSA.